Safely store product while taking up very little space. The Aardwolf Finished Goods Racks are for the storage of surplus stone pieces and finished items such as window sills, counter tops, etc. Rails are topped with 10mm thick white rubber, making them particularly suitable for sensitive stone slabs, preventing breakage and accidents. Features Posts can be remove.. 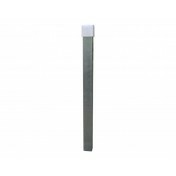 This 50 x 50 x 700mm post with a 2mm wall thickness and made from steel with a yield strength of 250 MPa is designed for the storage of finished goods and remnants with a height of no more then 900 mm. Specifications Weight: 2.4kg Storage Capacity The maximum number of marble or granite slabs that can be safely stored per bay at a 4° lean depends on the type of po..
Steel post base for accurate setting of 4° slab lean. .. 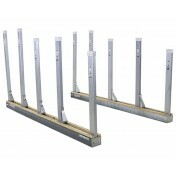 The Work Shop Racks are ideal for distributors and shops that use a variety of slab sizes. As inventory is used, posts can be adjusted horizontally, thus eliminating unused portions of the rails, making space available for replacement slabs and bundles. Please review our rack selection and specifications to select the correct rack components. Features The rack h..
A good racking system optimises the storage area and efficiency of your operation, providing many years of reliable service. As inventory is used, posts can be adjusted horizontally, thus eliminating unused portions of the rails, making space available for replacement slabs and bundles. Please review our rack selection and specifications to select the correct rack components. ..
A good racking system optimises the storage area and efficiency of your operation, providing many years of reliable service. 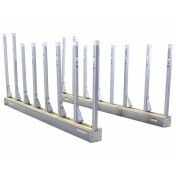 The Aardwolf bundle racks are ideal for distributors and shops that stock large bundles of granite and marble. 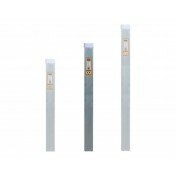 As inventory is used, posts can be adjusted horizontally, thus eliminating unused portions of the rails, making space available for replacement slabs and bu.. 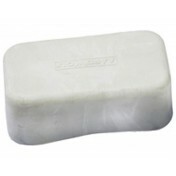 Protective rubber cap for 50 x 50mm slab rack posts. 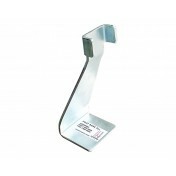 Prevents chipping or scratching of marble & granite slabs. Specifications Weight: 0.08kg .. 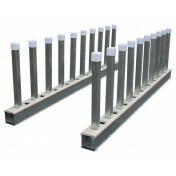 Protective rubber cap for 100 x 50mm bundle rack posts. 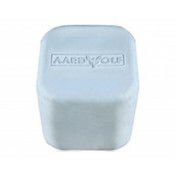 Prevents chipping or scratching of marble & granite slabs. Specifications Weight: 0.14kg .. 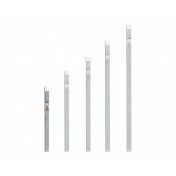 Extra strong posts 50 x 50 x 800mm with a 5mm wall thickness. Steel yield strength of 345 MPa. Specifications Weight: 6.5kg Storage Capacity Example The maximum number of 20mm thick marble or granite slabs, with maximum size slabs 3200 x 1100 x 20mm, that can be safely stored per bay (using 2 post) at a maximum 4° lean is: 44 slabs Storage Capacity The.. 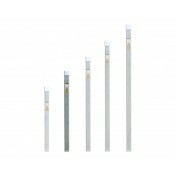 Extra strong posts 50 x 50 x 1200mm with a 5mm wall thickness. Steel yield strength of 345 MPa. Specifications Weight: 8kg Storage Capacity Example The maximum number of 20mm thick marble or granite slabs, with maximum size slabs 3200 x 1600 x 20mm, that can be safely stored per bay (using 2 post) at a maximum 4° lean is: 22 slabs Storage Capacity The .. 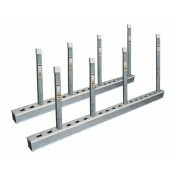 Extra strong posts 50 x 50 x 1400mm with a 5mm wall thickness. Steel yield strength of 345 MPa. Specifications Weight: 9.8kg Storage Capacity Example The maximum number of 20mm thick marble or granite slabs, with maximum size slabs 3200 x 1600 x 20mm, that can be safely stored per bay (using 2 post) at a maximum 4° lean is: 19 slabs Storage Capacity Th.. 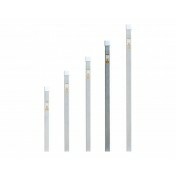 Extra strong posts 50 x 50 x 1600mm with a 5mm wall thickness. Steel yield strength of 345 MPa. Specifications Weight: 11kg Storage Capacity Example The maximum number of 20mm thick marble or granite slabs, with maximum size slabs 3200 x 2000 x 20mm, that can be safely stored per bay (using 2 post) at a maximum 4° lean is: 12 slabs Storage Capacity .. 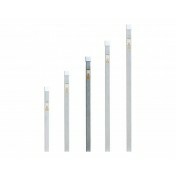 Extra strong posts 50 x 50 x 1800mm with a 5mm wall thickness. Steel yield strength of 345 MPa. Specifications Weight: 12.6kg Storage Capacity Example The maximum number of 20mm thick marble or granite slabs, with maximum size slabs 3200 x 2000 x 20mm, that can be safely stored per bay (using 2 post) at a maximum 4° lean is: 10 slabs Storage Capacity T.. 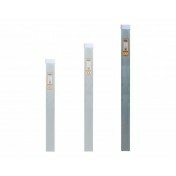 Extra strong posts 100 x 50 x 1200mm with a 5mm wall thickness. Steel yield strength of 345 MPa. Specifications Weight: 12.5kg Storage Capacity Example The maximum number of 20mm thick marble or granite slabs, with maximum size slabs 3200 x 1600 x 20mm, that can be safely stored per bay (using 2 post) at a maximum 4° lean is: 56 slabs Storage Capacity .. 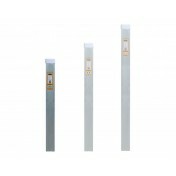 Extra strong posts 100 x 50 x 1400mm with a 5mm wall thickness. Steel yield strength of 345 MPa. Specifications Weight: 14.7kg Storage Capacity Example The maximum number of 20mm thick marble or granite slabs, with maximum size slabs 3200 x 1600 x 20mm, that can be safely stored per bay (using 2 post) at a maximum 4° lean is: 55 slabs Storage Capacity .. 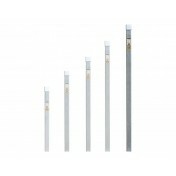 Extra strong posts 100 x 50 x 1600mm with a 5mm wall thickness. Steel yield strength of 345 MPa. Specifications Weight: 16.9kg Storage Capacity Example The maximum number of 20mm thick marble or granite slabs, with maximum size slabs 3200 x 2000 x 20mm, that can be safely stored per bay (using 2 post) at a maximum 4° lean is: 35 slabs Storage Capacity ..